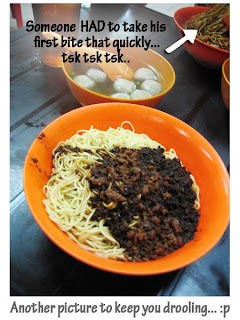 Had beef ball noodles a couple of weeks ago at Soong Kee, Kuala Lumpur. rif brought me to this place a few years back and I’ve been coming back for more ever since. 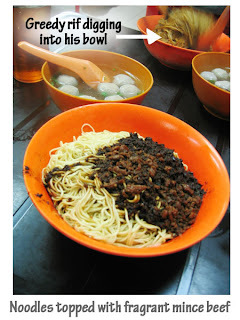 We ordered the dry beef ball noodles minus the tripes, both large (RM 4.50). Light and springy, the noodles came topped with fragrant mince beef. Our order came with 8 beef balls. The beef balls had a springy texture, like fish balls but much better. The chili paste provided was sourish and packs quite a punch. A delicious accompaniment to the beef balls and noodles. We relished every bite of our noodles and the beef balls. rif and I were so tempted to order another bowl to share…hehe (but we didn’t). We paid RM 9.80 for our meal including 2 cups of chinese tea. Pretty decent don’t you think? 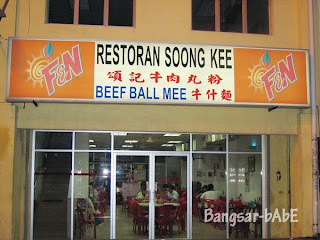 Verdict: This is THE PLACE for beef ball noodles. Enough said. Can you imagine that a big bowl was RM3.00 last time, and now its RM4.50??? Inflation!! !